Add Any Package: Want to make sure the life-sized portrait of your best friend and her new husband you had commissioned for their wedding or the pair of jeans you’re shipping back for return get there safely? Slice now lets you track your personal shipments, too. Just type in the tracking number or, easier still, use your smartphone to scan the shipping barcode on an outbound package with Slice’s new integrated barcode reader. Hello AOL, iCloud and Hotmail: AOL, iCloud and Hotmail users can now join their Yahoo! and Gmail counterparts in enjoying all that Slice has to offer. Guest Account: Want to give Slice’s package tracking a quick try before creating an account? Simply download the app, enter in the packages being shipped and Slice will keep track of them for you as they travel to your doorstep. Slice Android app is available now as a free download on Google Play. 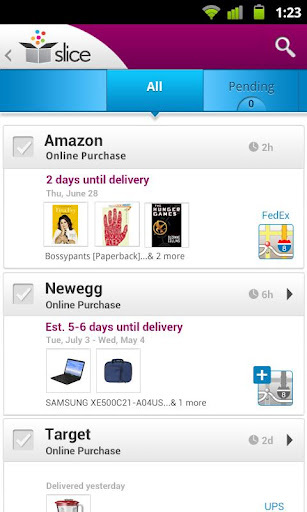 If online shopping is part of your life, you’ll be better off having this as one of the Android apps on your device.